The Ballroom is located on the second floor of the building and is accessible from the lobby by two staircases or an elevator. The ballroom space extends to the exterior walls at the north, south, and west, with large windows that provide scenic views of the lagoon and surrounding dune landscape. A series of decorative columns, offset fifteen feet from the exterior walls, along with a vaulted ceiling define the two story central space. The original terrazzo floors and decorative plasterwork at the columns and walls were recently restored. The fifteen foot perimeter area around the central space has a lower, barrel-vaulted ceiling. There are two bars in the Ballroom, located at east and west ends of the ballroom. 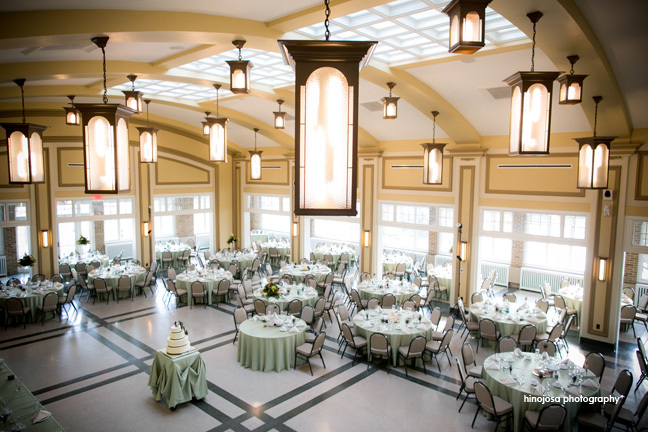 The Marquette Park Pavilion’s main kitchen is located immediately adjacent to the ballroom. The terrazzo stairways that provide access to the ballroom area from the lobby continue upward to a mezzanine level that overlooks the ballroom. From the mezzanine the stairs continue and provide access to a unisex restroom and two dressing rooms.